13 ¾" [35 cm] deep and 49" [124.5 cm] wingspan, after blocking. 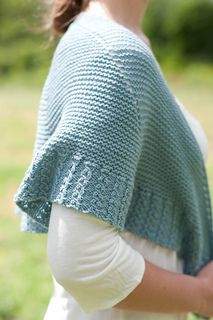 Ellison Bay is a crescent-shaped shawl with a garter stitch body and a textured mock-cable border. The shawl begins at the neck and grows outward with increases that are easily spotted by stitch markers. The inspiration for this shawl is Ellison Bay WI, one of our favorite places in Door County. The curved shape of the shawl and waving border are reminders of the water lapping on the rocky shore. 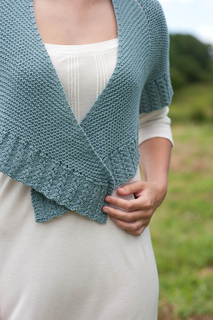 Enjoy knitting this practical shawl as you remember simple carefree days filled with your favorite quiet pursuits. Yarn recommendation: 3 skeins of Quince and Co Chickadee. Bird’s Egg.